Dianna's Diary: Where is Thy God? As the hart (deer) panteth after the water brooks, so panteth my soul after thee, O God. 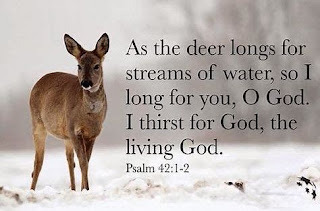 My soul thirsteth for God, for the living God: when shall I come and appear before God? My tears have been my meat day and night, while they continually say unto me, Where is thy God? There is a conflict that runs between our faith (spiritual realities) and sight (our human emotions). As we read Psalm 42, notice the psalmist struggling with some depression and the feelings of isolation from God. These emotions may have come from an absence of fellowship or discouragement from other believers, or by relentless unbelievers. Whatever the cause, these sentiments are real and recorded for our benefit. Some have assigned David to this psalm with his heart longing for the worship he knew in Jerusalem. He has left his home, the throne on which he ruled and now is fleeing from his son, Absalom, in great despair. Eating nothing because of his extreme grief and the bitter words expressed, his heart is overwhelmed. The Psalmist feels it is important to be honest with God about his doubts and struggles with a heavy outpouring from his heart. The writer is responding to the oceans of trials in which he seems to be drowning in and alleges that God is ultimately responsible for each turmoil. Have you wrestled with the emotions expressed in this psalm? Has your soul been “cast down,” within you? Are you facing challenges at this time and want to rely on God to work in your life? Psalm 42 reveals the character of God and ways He will help you to “walk by faith,” when you are downcast, in despair and depressed. Remind yourself, “Hope in God, He is your help!” Give thanks to God for His saving power and His mighty hand working in and through your life. He is the Lord God of all Truth (Psalm 43:11). You can trust Him. Lord, thank You for Your presences in my life.